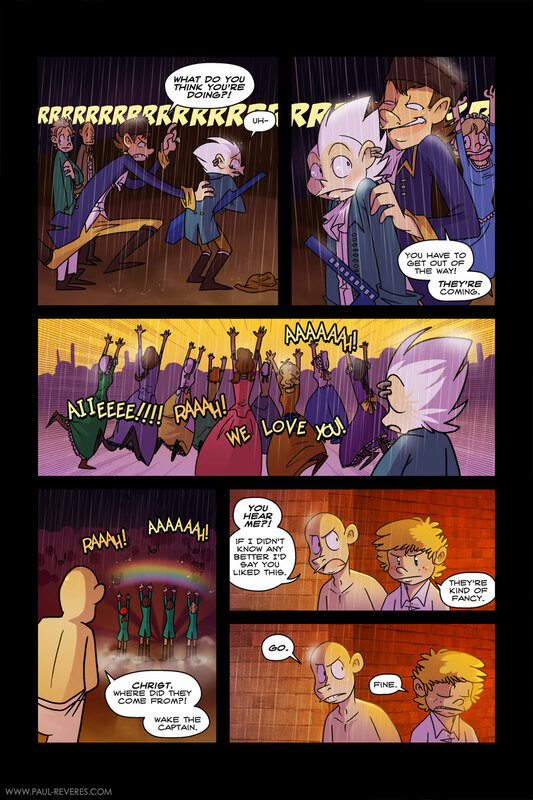 This is a record amount of ladies for a Paul Reveres comic page. They are all crazy. Also, had a great time meeting many of you at Anime Boston last weekend! I did a little write-up of it here, if you want to check it out. I’m going to be doing some updates with a lot of new stuff to the Online Store this week. I have Issue #4, The Union Jack-Offs t-shirts, GMB Poster, Sketchbook and two brand new items I won’t announce until they go up in the store. I’ll make an announcement on the twitters and facebook immediately when the new items go up. XD Should have known. Where there is a boy band, its sure to be followed by crazed female fans! Great colors in this page! I love that 4th panel with the rainbow flying over their heads. Magical! PANEL TWO. DerpGirl is incredibly excited. I am in love. Is this a clever way of saying that Americans fight dirty? Ah no the fan girls, run before they pull out the team shirts!!!!! By the way the song thing rick rolled me XD !!! !